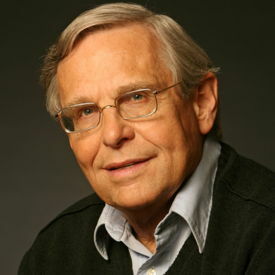 Richard Maltby Jr. is a lyricist, director, book and screenplay writer, and producer who has made a name for himself in the theatre community through his work on many successful Broadway shows and musical revues. His claim to fame is his conception and direction of the only two musical revues to ever win the Tony Award for Best Musical. Maltby was born in Ripon, Wisconsin, on October 6, 1937, to Virginia and Richard Maltby Sr, a famous band leader. He attended Yale where he met David Shire, a composer and his main collaborator, and they wrote two musicals together during their undergraduate years. They continued to work together after college, writing at least six full scores of songs, some of which gained notoriety by being sung by and featured on the albums of Barbra Streisand. Maltby’s first big break came with the production of a musical revue of his songs in 1976 at both the Manhattan Theatre Club and the Barbarann Theatre Restaurant called Starting Here, Starting Now that ran for 120 performances and produced a cast album that was nominated for a Grammy Award. He then worked on Ain’t Misbehavin’, a musical revue about the life of Fats Walter, that was so successful that it moved to Broadway in 1978, ran for 1,604 performances, and garnered the Tony Award for Best Musical. His next few ventures as lyricist include the musicals Baby and Song and Dance, as well as the revue Closer Than Ever all of which earned him Tony nods. However, his biggest success came a few years later with his work as co-lyricist on Miss Saigon (1991), which won three Tonys and ran for a decade. He also collaborated with them on the less successful Pirate Queen in 2007. Other notable projects include lyrics for the musical Big (1996), direction of the Best Musical Tony-winning nod to Bob Fosse’s life called Fosse, and a screenplay for the film Miss Potter. He has been nominated for and won many awards including Tony Awards, a Grammy Award, an Olivier Award, Drama Desk awards, and an Outer Critics Circle award. In his free time, he also enjoys writing crosswords for Harper’s Magazine. Shows by Richard Maltby, Jr.